I pride myself on being someone who is passionate about clean eating. But I’m far from perfect; standing before the stove, it’s a nightly struggle between clean and convenient – which, as I hope I am illustrating with this blog, are certainly not mutually exclusive! But sometimes even I give in to the corporate food giants’ mythical siren song extolling the virtues of prepared food convenience – aka sometimes I’m short-sighted and forget to plan! I’ve been pretty good this year about veering away from canned goods after hearing more and more about the creepy BPA in the plastic inner lining of the cans leaching into food and the health problems that is thought to cause. I’ve mostly banned myself from buying them if a suitable non-canned alternative can be obtained. But I recently bought canned black beans to have on hand during a busy week of planning a Halloween party I was hosting (it was epic! Peanut Butter and Jelly Toast and the Corpse Bride and Mario of Super Mario Brothers fame were there!). And last week, when I wanted chili, and I wanted chili fast, there they were in my cupboard, looking all doe-eyed and convenient, just begging to be used. Couple those with some stewed canned tomatoes left over from a bruschetta station I had at the soiree, and Quick and Dirty Beef and Black Bean Chili was born! It’s quick (barely any simmer time! ), it’s easy (brown meat, dump in some cans and spices! ), it’s surprisingly delicious given the lack of time and effort needed to cook it. Who said being lazy can’t pay from time to time? And if you want to use dried beans in place of the canned beans, as I plan to do so in the future, you can definitely do so. Let one half a cup of dried black beans soak in a bowl of water (with the water covering them by at least a few inches) for at least eight hours. Then drain and rinse them and boil them at a gently rolling simmer for one hour before draining and rinsing them again. Additionally, you can use two cups of diced fresh tomatoes in place of the canned tomatoes. I should mention: this chili is rather hot and spicy. I love hot and spicy! But I know not everyone does. 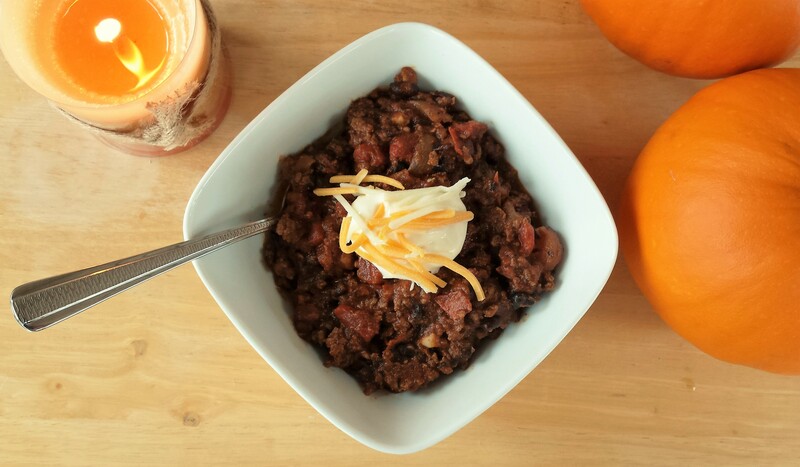 If you prefer a milder chili, you’ll want to eliminate or reduce the amount of cayenne pepper used. To a large pot over medium heat, add the grapeseed oil, onion, and garlic. Let cook until softened, about four minutes. Add the ground beef and cook for an additional four to five minutes, stirring occasionally to ensure even doneness, until it is fully browned. Then mix in the diced tomatoes with juice, black beans, water, chili powder, salt, black pepper, cayenne pepper, and cumin. Reduce to medium-low heat and let simmer for at least 10 minutes. And you’re done! Garnish with your favorite chili toppings, such as sour cream, shredded cheddar cheese, diced green onions, and tortilla shreds. Makes about four servings.